In May of 2017, I talked about heading to Namibia for a holiday. I had been particularly attracted to the clay pans of Deadvlei and the ghost town of Kolmanskop. After a bit of planning with a travel agent, my partner and I agreed on a 17-day self-drive trip that would take in these two locations as well as a few others that weren’t first considered. 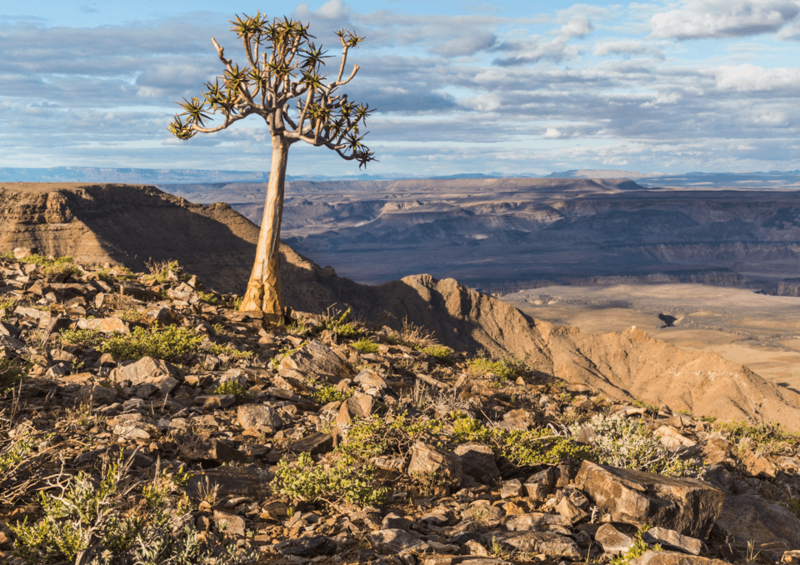 A couple of months before we left for the trip, I received an e-mail from Martin Bailey, a photographer based in Tokyo to ask if I would assist him in his complete Namibia tour. As luck would have it his tour starts a few days after my trip was due to finish. As a result, I am very fortunate to be heading around the beautiful Southern African country twice in seven weeks. This post is going to look at the first ‘personal’ part of the trip which I have just completed. There are 16 photographs that give a flavour of this wonderful country. I’ll then follow this up with a further post that will see Namibia from the perspective of leading a group. After landing in the capital, Windhoek, we travelled to Okonjima. This is a sanctuary that looks after orphaned cheetahs. Cheetah can attack the farmers’ herds. 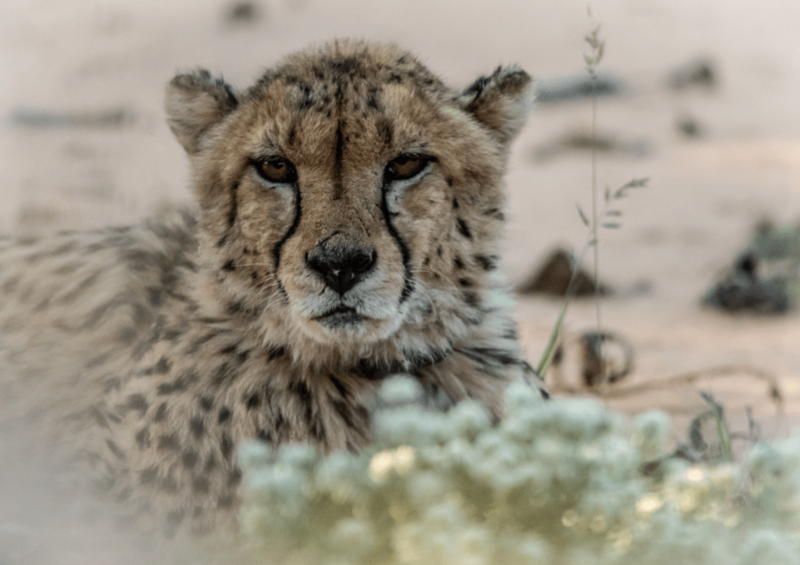 Without education from the Africat Foundation that runs the sanctuary, they will kill the cheetah leaving the kittens as orphans. All the cats in the reserve are being taught how to hunt and are collared so that the reserve can trace them. This photograph was taken on foot standing about 4m away from a live cheetah. The key to getting a photograph like this is to get as low to the ground as possible so that you are level with animal and it also had the benefit of covering the collar around the neck. I also wanted to ensure that there was as little grass as possible covering the face, so it was necessary to move around slightly. The shot was taken using the Sigma 150-600mm with a 1.4x convertor at f9.0 with a shutter speed of 1/1600. The shutter speed was so fast to ensure that there was as little camera shake as possible. As a result, the ISO was set 8000. In post-processing I cropped in slightly tighter and I thought that for this shot it would be nice to add in a white vignette. I also warmed up the white balance slightly. The Onguma Reserve is a couple of kilometres away from the main gate to the Etosha National Reserve. This shot was taken at the end of an evening game drive. We’d spotted a group of four cheetahs and had been tracking them for around an hour. One of them had attempted to make a kill of a black-backed jackal but was unsuccessful. Facing a hungry night, the four cheetahs moved away and settled on a rock. The shot was again taken with the Sigma 150-600mm and 1.4x convertor at f7.1 but due to the low light, I had to balance the lens on the side of the car and shoot at 1/60th of a second. Even with this shutter speed I still needed an ISO of 12800. 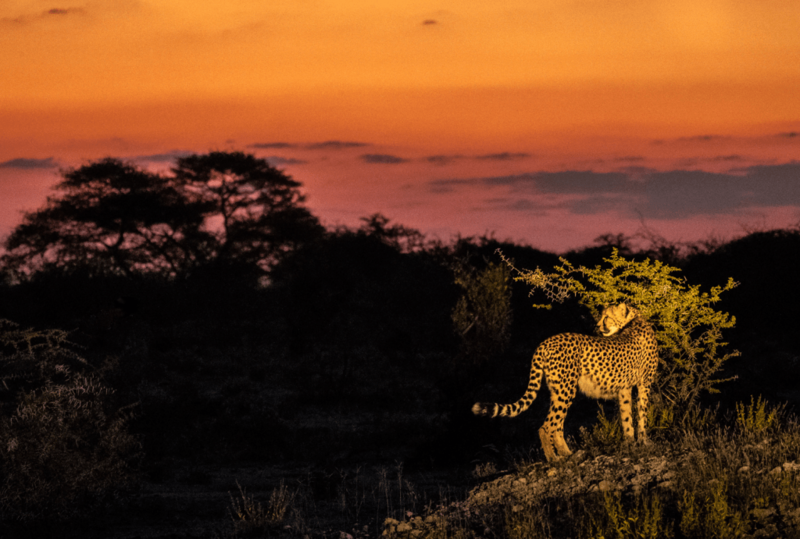 The final addition to this shot was a Toyota Land Cruiser which shone its headlights onto the cheetah, balancing out the beautiful sunset. You can read more about using different sources of light in my earlier post. In terms of post-processing for this image, it was just a case of a very small crop and I took back some of the shadows. There was also a little noise reduction added. I’m very proud of this picture and it’s great that it hardly needed any work to make it beautiful. The Etosha National Park is a government-owned park cover 22,700 square kilometres which includes the Etosha Pan, a salt pan that covers 23% of the park. Due to the time constraints, we only had one day to travel from the Von Lindequist Gate on the east of the park through to the Anderson Gate on the south-west. 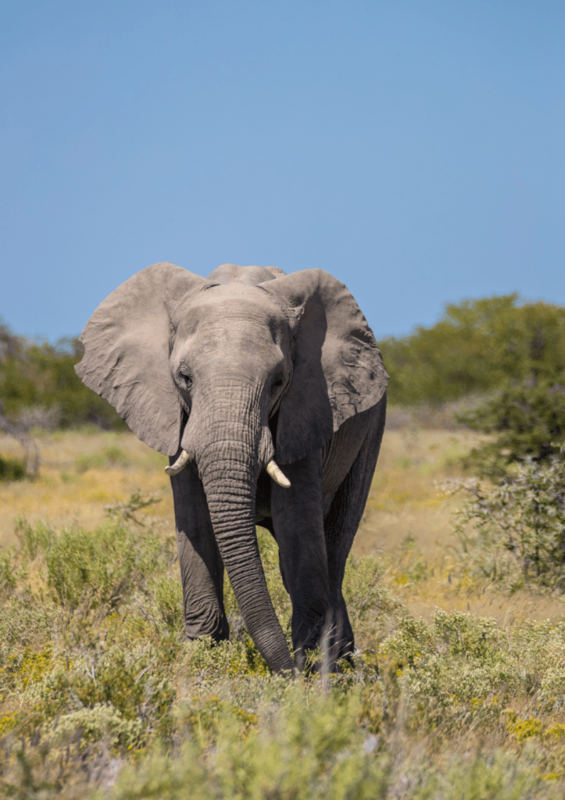 The Etosha park has a series of roads leading to water-holes that come off a single gravel road that traverses the park. As we were self-driving we didn’t have a guide to help us work out where the animals were and also had to limit the number of water-holes we visited to ensure we arrived at our accommodation on time. At each of the hotels inside the park there is a book where visitors can write which animals they saw and where but remember, these are live animals and they do move throughout the day so whilst this is helpful, it isn’t a guarantee. Even without a guide, we spotted several elephants, zebra, giraffe and even a cheetah attempting to hunt on the edge of the Pan. The best shot of the day though was this bull elephant that was about 100 meters from the side of the road. Again, it was shot on the Sigma 150-600mm with 1.4x convertor at f9.0 at 1/1000th of a second, ISO 400. 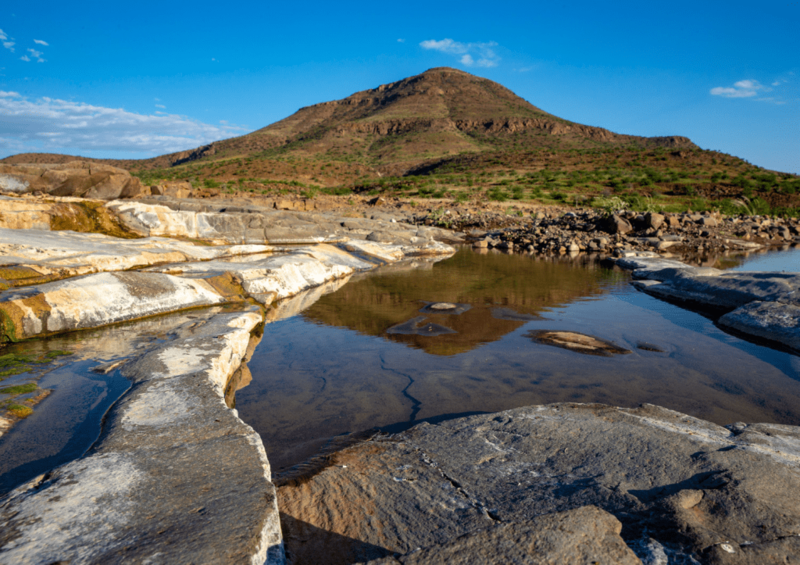 Our next stop was a remote camp in Damaraland which is in the north-west of Namibia. Guests are advised to leave their cars at the Palmwag Lodge and then they are transported the 23km drive to the camp along some pretty hairy tracks. The journey to the camp was beautiful though with hundreds of zebras, antelopes and giraffes happily grazing in the lush grasses that had appeared following some late rains. 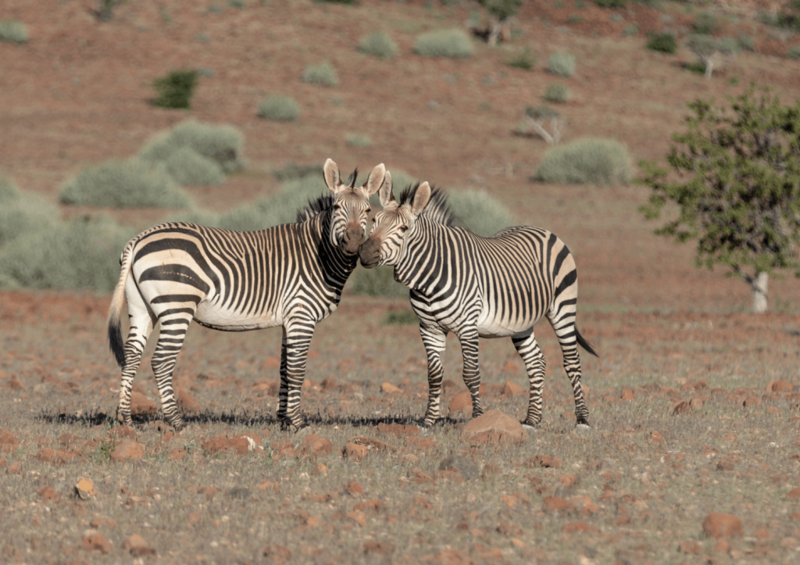 This first image from the drive captured two zebra kissing. It is quite heavily cropped as this was shot on the Canon 70-200mm with a 1.4x convertor on. They were about 200m so they weren’t as close as I would have liked but it does capture a pleasant scene. The setting for this image are f5.0 at 1/400th of a second with an ISO 400. Ideally, I would have had the Sigma lens on but I had taken a choice on the car ride and the best lens and camera scenario is the one you have available to you. 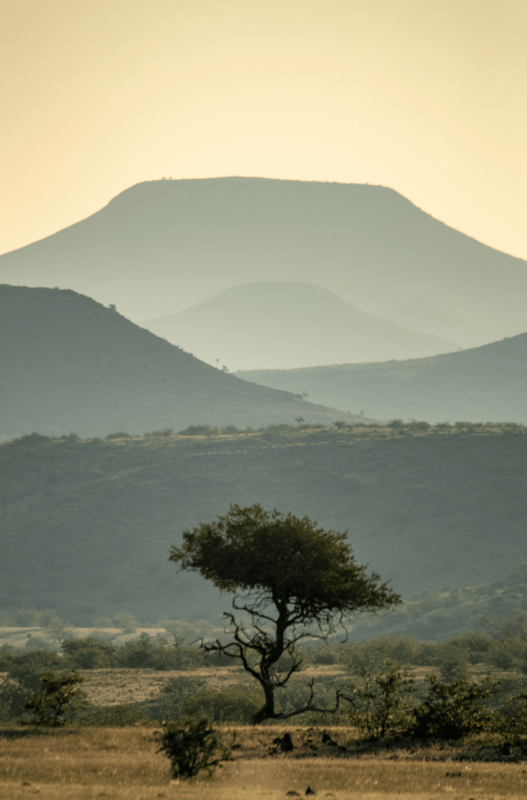 This second image from Etendeka was taken on a Game Drive through the area. The mountain is called Zebrafontaine and forms part of the Etendeka Mountain Range. This area is usually very dry with very little rainfall during the year. However, a few weeks before our arrival there had been a heavy rain which meant that there was water in the river. The other members of the game drive were laughing as I got out of the car and was lay on the rocks to get the reflection of the mountain in the rocks. I think it was worth the laughs! The picture was shot at f11.0 with a shutter speed of 1/250th of a second and ISO 320. I was prepared to give a little on ISO to ensure the image was sharp as I was hand-holding the camera. I used the hyperfocal technique to get the maximum sharpness from the front to the back of the photograph. This next picture was taken just 12 minutes after the last one and so was probably only a few hundred meters from where I had been laying on the rocks previously. 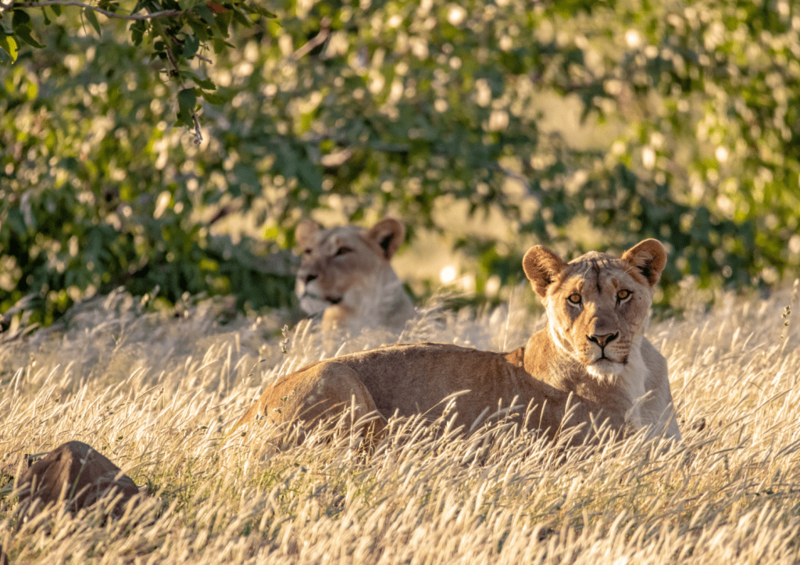 These lionesses are part of a pride of about 12 lions which roam in the range. It was shot on the Sigma 150-600mm with the 1.4x convertor at the very edge of the focal distance. I used a shutter speed of 1/1600th of a second at f9.0 which gave an ISO of 6400. I applied a small crop and used noise reduction to remove some of the grain from the original shot. The final shot was taken at the end of the game drive and shows how a long lens can be a great tool for landscape photography. The mountain range has layers of peaks and by using the Sigma 150-600mm I was able to compress the mountains and the tree to make them appear closer together. It was shot hand-held at f9.0 with a shutter speed of 1/1250th and an ISO of 800. Our drive southwards took us through the town of Solitaire. 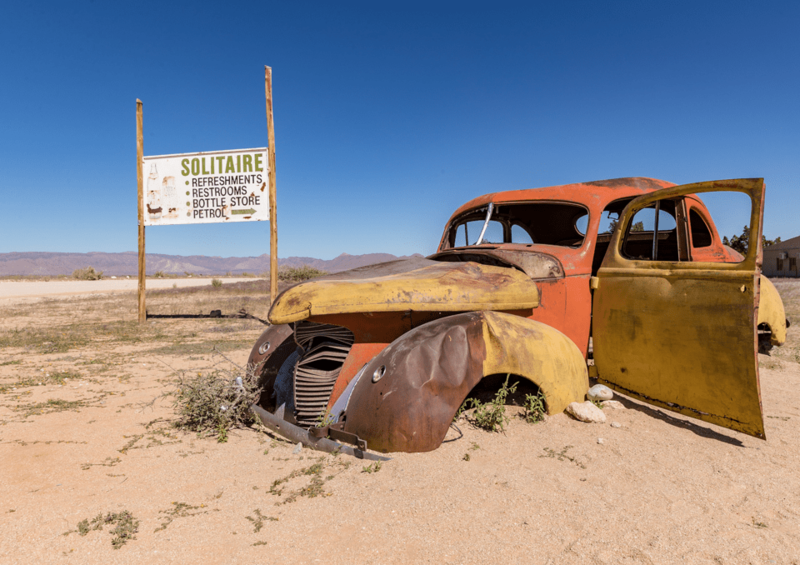 It is known for two things, the Apple Strudel that can be bought at the bakery by the petrol station and these old cars that have been left to rust. Pretty much everyone has to stop at Solitaire as it is the only petrol for around 150km so it takes some patience to get a shot of the car without tourists taking selfies or a car driving past. 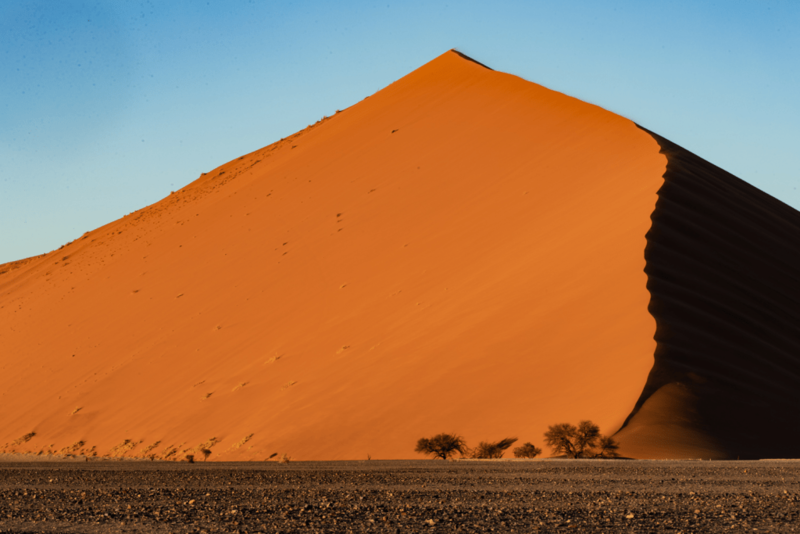 The dunes of the Namib desert were my initial draw to Namibia. The sand was blown over millions of years from the Kalahari desert toward the Atlantic ocean. They settled into a series of dunes that line a highway which leads from the gate which is opened at dawn. We stayed in the Little Kaluha lodge which has a private gate into the area and gives us a few extra minutes of a head-start to others. The first few minutes after dawn are like the wacky races as people rush from the gates to be the first on the dunes. This first scene is taken from the roadside on the Canon 70-200 at f14 with a shutter speed of 1/15th of a second at ISO 100. The sun is landing on one side of the dune and lighting up the trees but the other side is in shadow. If you look closely at the image you can see there is lots of detail in the shadow. A few minutes later and the sun would start to shine on the dark side of the dune leading to a much flatter image. 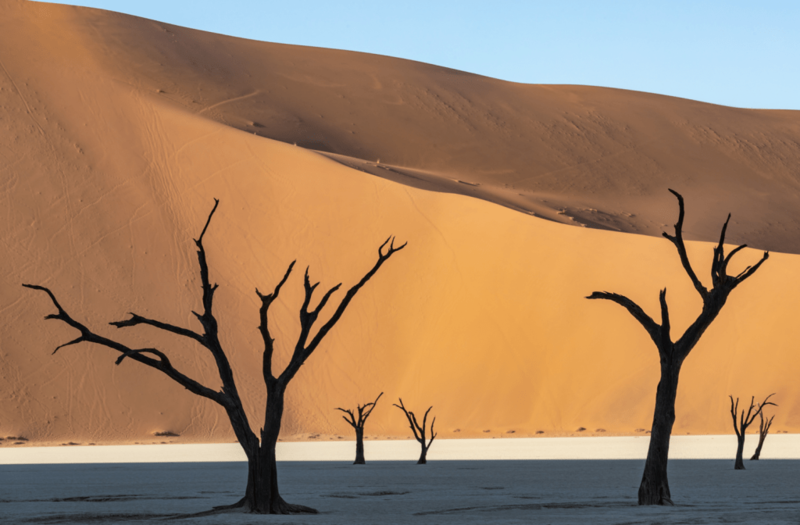 This next scene is taken in the clay pan of Deadvlei. The camelthorn trees in the shot are between 500 and 1,000 years old and due to the lack of rain that falls they don’t rot. For a few minutes each day the sun rises enough to light up the dunes behind, but the trees and the ground are in shadow. The result looks almost like a Dali painting. This was shot hand-held lay on the floor using the 70-200mm lens at f10.0 with a shutter speed of 1/160th and ISO of 100. 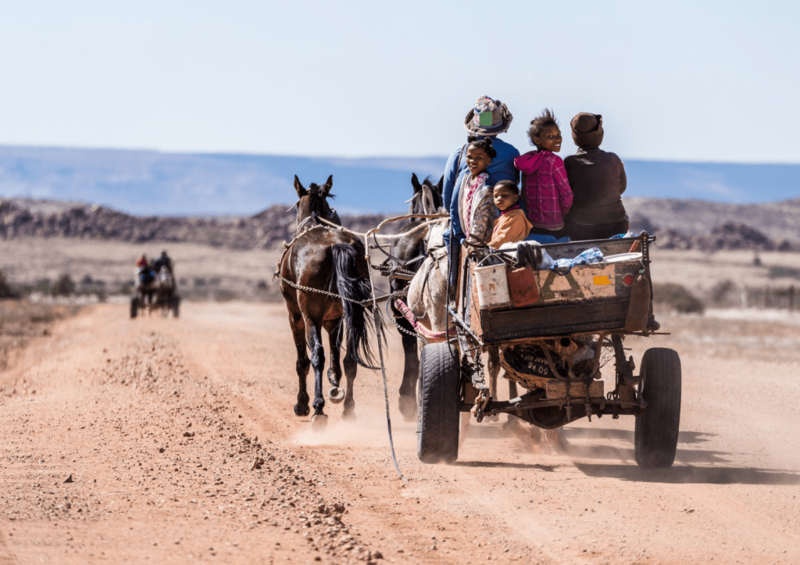 We had a long drive to the town of Aus from the Namib desert and on the way passed these two families travelling who knows where on their horse and cart. This had to be a quick drive by shot so we made about 400m gap between us and the horses to give just enough time to capture them driving toward us and then this shot, as they passed. The girl turning around and smiling added a nice little touch to the scene. The shot was taken with the Sigma 150-600 at a shutter speed of 1/800th of a second with an aperture of f6.3 at ISO 200. At the start of the 20th century a diamond was found on the floor in an area outside Luderitz on the south-west coast of Namibia. A resultant diamond rush led to the development of a railway and towns to extract the diamonds from the landscape. 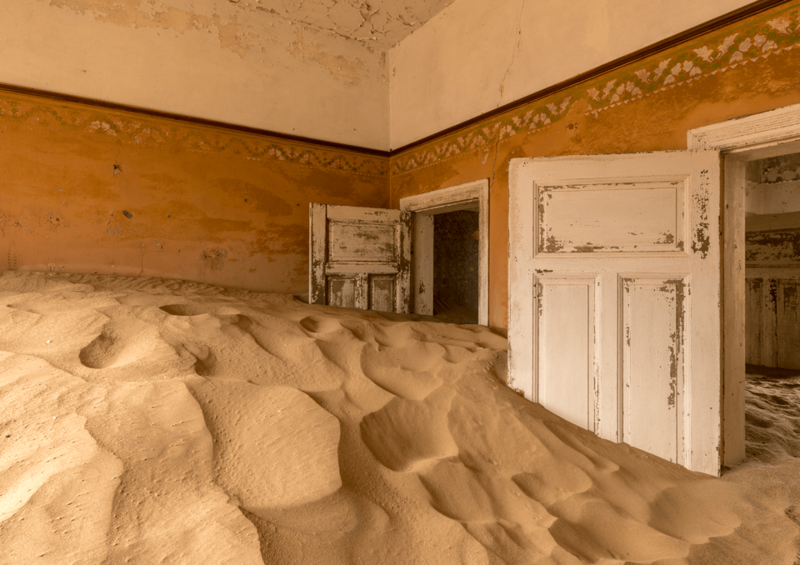 Kolmanskop was one of the towns created. 60 years later the rush had ended and the settlers left the houses to be taken over by the sands. In the 1980’s people re-discovered the town and it has turned into a ghost town museum where visitors are free to enter the buildings which are being returned to nature. It is possible to get entry into the town from 7am by paying for a photographers pass, which costs $220 (Namibian dollars not UK so approximately £13), However, on this particular day there was heavy rain so there wasn’t much benefit in getting in early as the light conditions were quite flat. This image was taken at f14.0 with a shutter speed of 0.8 seconds and an ISO of 100 using the Canon 11-24mm f4.0 lens. These next three pictures are taken at the second largest canyon in the world behind the Grand Canyon in the US. The first is a wind turbine which drives a water pump that brings water to the surface and is used to give the wildlife in the area a water-source. I moved so that the sun was shining through the hole in the bottom of the structure to create a starburst. 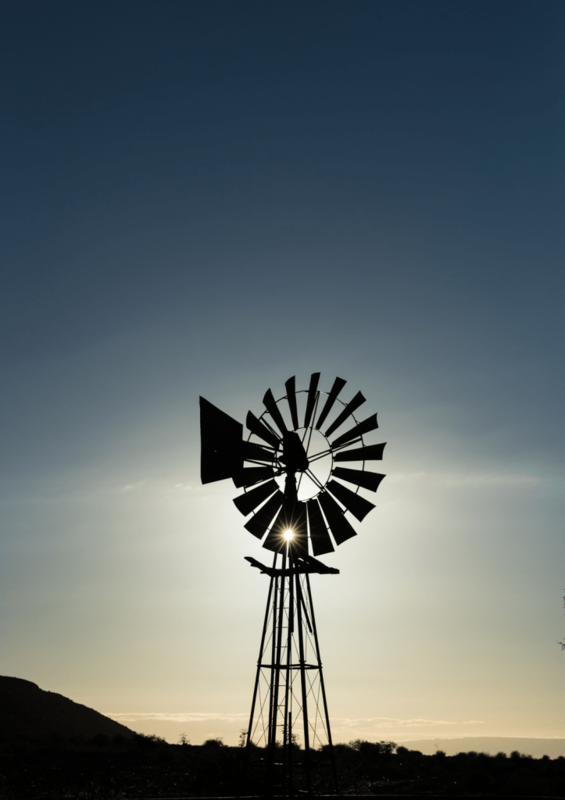 The image was purposely underexposed to create a silhouette of the turbine and add impact to the starburst. Shot on the Canon 24-70mm it uses an aperture of f7.1 with a shutter speed of 1/2500th of a second and ISO 100. It’s only when taking a shot like this that you realise how quickly the sun traverses the sky (or more correctly, how quick the earth is turning) so it was important to be as quick as possible to get the shot when the sun was at the right point. The next image though needed far more patience. Taken on the very edge of the canyon, I could see that the quiver tree would be a nice subject, but the clouds were preventing light hitting it and the canyon was illuminated. I sat for over 30 minutes waiting for the clouds to create a shaft of light onto the tree. It’s great when this happens as you can sit and really appreciate the nature you are surrounded by instead of concentrating on your camera. The settings are f16.0 at 1/40th of a second with an ISO of 160. The final image from Fish River Canyon is a sunrise shot. 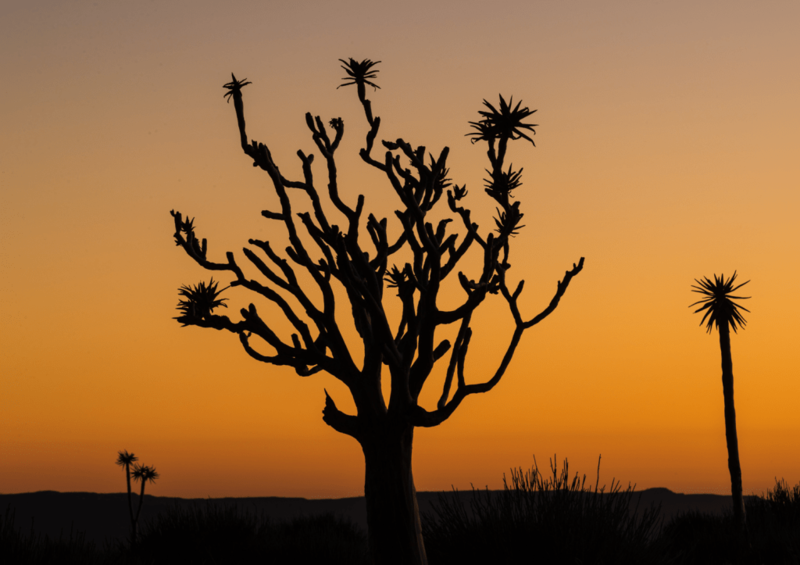 These quiver trees are found in the south of Namibia and make a great silhouette subject with the warm morning light behind them. Shot at f13.0 with a shutter speed of 0.4 seconds and an ISO of 100. The last image of this set was taken in the Kalahri desert. It’s not strictly a desert but a semi-arid savannah and stretches 930,000 square kilometres throughout Botswana, South Africa and Namibia. The first settlers into Namibia were the Bushmen. They now only number around 25,000 and speak in a largely unchanged language which includes a series of six different clicks. 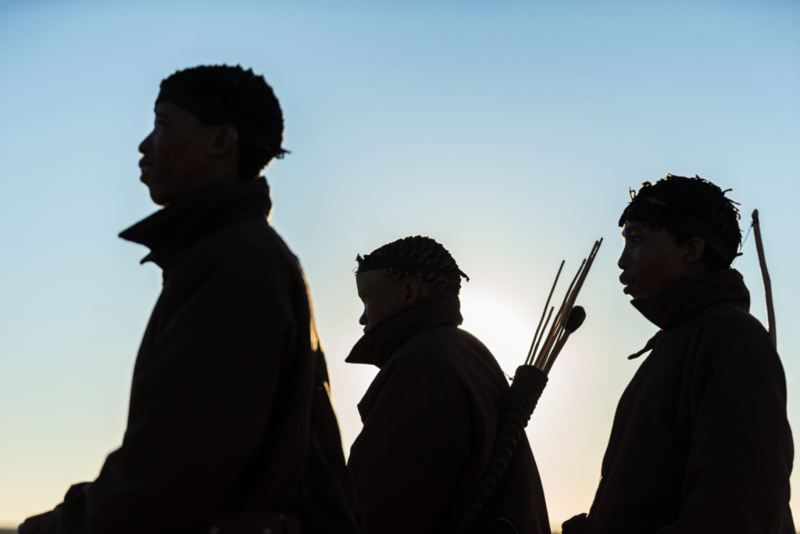 These three bushmen carry out demonstrations of how their ancestors would have lived. I asked them to go to the top of a small dune where I could create a nice silhouette of them against the rising sun. The settings for this shot are 1/1250th of a second at f2.8 with an ISO of 100. This ends this photographic review of 17 days travel covering nearly 4,000km and it will be interesting to compare this trip against the guided photographic tour that I’ll be assisting in a weeks’ time.